Music, with its “infuriating soul particles”, progressively accentuates the cadence and the vibration. The drum thumbing as never before, scourges the tensed neurons of the goading ones. The inciting rhythm perpetually accelerating, motivates the hasty dancing, finally driving the devoted to the highest climax, to the ecstatic fervour, the one “given by the holy fate” according to Plato, the grace offered by the “summoning of the saint” according to (Anastenarides) the fire walkers. Field recording of a ritual plus minimalism, maybe we could describe it as such. Yet another secret from the Greek vaults, a ceremony taped in 1979 at the Agia Eleni village, Serres. The whole revolves around a walk-on-fire performance, of which the CD explores the preparatory atmosphere. Translation: people talking (in the local language, of course – fascinating for those who don’t know it, resulting as just music to my untrained ears) and, especially, a fabulous series of percussion-driven violin ostinatos, a cross of East European dissonance and Steve Reich’s “Violin Phase” in a country-tinged version. Ceaseless rhythmic pulses that go on and on, our mind easily adapting to the semi-regular patterns until we come across short interruptions where someone talks again, then everything starts ex novo with additional figurations and analogous repetitions. It lasts 65 minutes circa, but neither I had a second thought about my liking of it, nor endured an “enough is enough” feel, even in the (possibly) less significant moments. The audio quality is also quite good – that surely helps. Traditions are hard to die, at least in recorded form: that’s fine with me. Aναστενάρια, is an almost ancient ritual still practiced in a few areas of northern Greece. The ritual, nowadays completely recapitulated by Christian religion involves an ecstatic condition for the participants and some walking or dancing on burning coals. When I witnessed this ritual a few years ago, I was disappointed: too much Christian symbolism and icons, too much sociopolitical antagonism (“who is suitable to take part in the ritual and who is not”) and not enough ecstatic condition. Still the coal walkers danced easily on the hot coals. Which only made me wonder on how hot a burning coal is after all… Anyway, this is a recording of a ritual back in 1979, which includes apart from the monotonous, trance like patterns of zournas, ntaouli and lyra (that is, strings and drums) an aural description of the various stages of the ritual -sacrificing of an animal, eating it (why people always sacrifice animals to gods and then eat them alone?) etc-. A release which can stand alone as an “ethnic” document, but also as field study of a value. 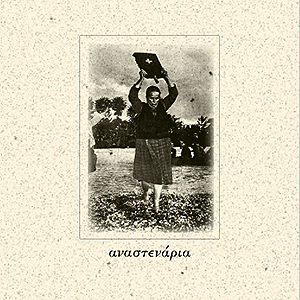 More folklore on the release called ‘Anastenaria’, and although I hate to refer to websites, there is a lengthy story on the events held at Ayia Eleni, Langada and other Greek places here: http://www.anagnosis.gr/index.php?la=eng&pageID=143. It’s about a ritual that dates back to Pagan times and this release is a pure field recording of the 1979 (!) event. We hear drums, violins, chanting, people talking, which makes hardly sense if you don’t know what it is about but has a true ethnographic feel to it. I must say that I listened to it with interest, but found it difficult to relate to. It reminded me also of the good 80s cassette scene when ‘field recordings’ such as this, think Calanda, were released.